Franklin D. Roosevelt, Fala, and unkown woman via a qualidade do silencio. Nicolaus Mills, a professor of American Studies at Sarah Lawrence College, looks at Fala and Checkers's roles in presidential races. It's fascinating, but I hope Bo remains simply a pet and not a politician. The Vice President and his family enjoy the beach with their dog Checkers while on a weekend holiday in Mantoloking, New Jersey, in August 1953. Via the Richard Nixon Library. P.S. If anyone knows anything about the FDR photo, please email me. I would love to know more about it and give a photo credit. 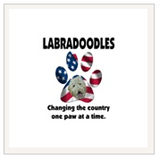 Laddie Boy: Most Popular Presidential Pet Ever! Laddie Boy approves his official portrait. Laddie Boy was President Warren G. Harding's Airedale, and according to The Smithsonian, the most popular presidential pet ever. I can't believe I never heard of him. Though there were many presidential pets before him, Laddie Boy was the first to receive regular coverage from newspaper reporters. "While no one remembers him today, Laddie Boy's contemporary fame puts Roosevelt's Fala, LBJ's beagles and Barney Bush in the shade," says Tom Crouch, a Smithsonian Institution historian. "That dog got a huge amount of attention in the press. There have been famous dogs since, but never anything like this." Laddie Boy greets President Harding upon his arrival home from a trip. Laddie Boy with his birthday cake made of dog biscuits. Laddie Boy with White House kennel master Wilson Jackson. Laddie Boy presides over the annual Easter Egg Roll in 1923. Laddie Boy gazing through the White House window. The next day President Harding died in San Francisco. Life-size sculpture of Laddie Boy at the Smithsonian by sculptress Bashka Paeff, made from more than 19,000 pennies donated by newsboys. All photos courtesy of the Library of Congress. See more at the Smithsonian. Zachary Taylor's Inauguration invitation with his horse Whitey. Copyright 2008 - The Barry H. Landau Collection. Presidential historian and collector Barry Landau loves animals, especially if they have an inauguration connection like Socks, Chelsea Clinton's kitty. But one of Landau's favorite inaugural stories revolves around pre-Civil War President Zachary Taylor's Army horse, Whitey. "People know Buddy, Socks, and Fala [FDR's pet Scottie]," he says. But Taylor's horse is another story. Taylor, the 12th president and a Mexican War hero, actually had a picture of Whitey drawn on his inaugural invitation. "It's one of the most elaborate invitations and one of the most highly collectible." I hear Frost/Nixon is very good. I also hear that the Dachshund (not Checkers) steals the show. Full story at The Long and Short of It. We have good news and bad news from the Obama transition team. The cutest Clintonite of all is on board, but perhaps not for long. Socks the Cat, the most adorable White House pet since Hoover's German Shepard, was kicked to the curb after the Clintons left the White House. He was foisted on poor Betty Currie, Clinton's secretary. Now, here is the good news: Socks is back in political favor! Obama's transition co-chairman is John Podesta, and Podesta just hired Currie to be his secretary! But here is the bad news: Socks has cancer. He's 19! That is very old, for a cat. At least he outlived his mortal enemy, Buddy the Dog. "We just got to keep it street." "A pitbull," the entertainer says. Jokes Foxx: "(I'm) trying to pick out Barack Obama's Christmas puppy right now, so we're working hard on that. I think I'm going to get him a pitbull, we just got to keep it street." He says: "I'm just celebrating Barack Obama (and) celebrating the new president," he said. Ummm, yeah...there is no way Michelle is going to get a Pitbull for her two little girls. Don't write me and tell me that Pitbulls are the most gentle dogs in he world. They always are, right before they're on the 6 o'clock news. And NOBODY wants the whole Sarah Palin/Pitbull/lipstick/pig meme bubbling back up in the media again. "We're not looking for trouble. But we're ready for it." WWI poster and possible tattoo for Hillary Clinton. And a Pitbull named Bud was the first dog to travel across America in a car. Wouldn't he be great administering the new big dig public works recovery package? See, there's plenty of room for a Pitbull in the new Obama Administation. Let the girls have their girly dog. Info and images via the American Pitbull Registry. "Adopt a puppy from the shelter: It's beyond me why you didn't do this the moment the Iraq war went bad. If you're on TV with the cockerdoodle puppy you pardoned from death in some dog pound, Brian Williams can blather on about Muqtada Sadr all he wants but no one will hear a word because they'll be staring at the adorable puppy. Make sure the press pool gets lots of B-roll of said puppy looking sad in a cage to run against shots of you and Sparky rolling around together in the Rose Garden." From winning elections to averting armageddon, dogs have played a pivotal roll in our nation's history. Peter Grier of The Christian Science Monitor looks at pets in the White House and why President Obama might want a dog as much as his girls do.